Join the discussion on our forums! Come discuss Blastmaster Boom over in our dedicated Blastmaster Boom discussion topic. Battlecry: Summon two 1/1 Boom Bots for each Bomb in your opponent's deck. He's gonna fly through the air with the greatest of grease. Is Bomb Warrior viable in Wild? Neat to know he has his own summon quote when you play him against the hero Boom. Looks like a fun potentially good card. Sounds fun, but might be just meme... You never know tho. Boom Bots got Rush with Dr. Boom, Mad Genius. Add Clockwork Goblin and Wrenchcalibur to your deck, and you should be able to put at least 2 Bombs in your enemys deck before you play Blastmaster Boom. Four to five bombs throughout the game + 4-6 Boom Bots adds a nice Win Condition for Control-Style Warrior builds. Keep in Mind that Archivist Elysiana for example can replace the bombs. Probably gonna craft the whole package and fit it into my Dragon Warrior. Don't forget it's boom O'clock! This has to work with Iron Juggernaut's Burrowing Mine. 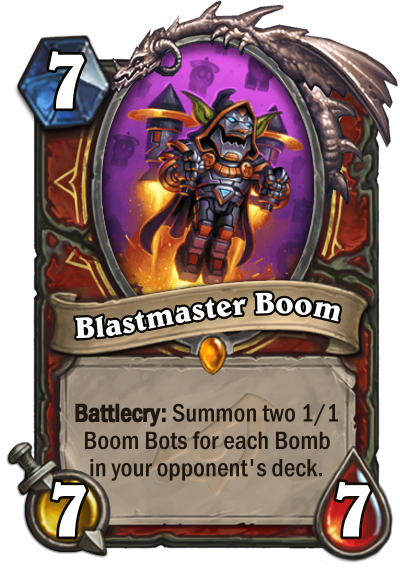 No i dont think so because it says "for each bomb" and the Iron Juggernaut puts a Mine in the enemy Deck.